This past week, The People's Republic of China celebrated the 20th anniversary of brutally suppressing a movement of the people by purchasing Hummer. The blood of Tiananmen became a salvation for the people in Eastern Europe. For on July 7, 1989, in the Romanian capital of Bucharest, Gorbachev signaled to the Eastern bloc leaders that the Soviet Union would not use force to interfere with reform. Aware of worldwide condemnation of the PRC, Gorbachev did not want another Tiananmen massacre. Just as the Tiananmen students began by asking for an end to corruption, the demonstrators in East Germany asked for the freedom to travel. The Tiananmen students showed the world the power of peaceful demonstration and the citizens of the Eastern bloc took notice. By November 9, 1989, the Berlin Wall fell. We remember the dream, we remember the hope, we remember that time in the Spring of 1989 when the Chinese people, led by the students gave each other a gift, the gift of freedom, the freedom from fear. May the memories of Tiananmen Spring live and will one day flourish. Would The Oklahoman ever concede that it was anything beyond Ronald Reagan blinking an eyelash that could have been a factor in something like this? I doubt it quite sincerely. So anyway, today the lovers of human rights also known as The Editorial Staff of The Oklahoman are talking about how "...Pretending Tiananmen Square didn’t occur is a reminder that true freedom — the freedom for people to disagree with their government — still is withheld from billions of Chinese by leaders accountable only to themselves." As I wrote yesterday, people in Israel are standing up to Avigdor Lieberman and the other small handful of radicals in Israel proposing laws to criminalize people who commemorate the Nakba. It is serious business, and exactly the kind of thing the Editorial staff discusses in this piece. However to this date they haven't mentioned this subject. I can only assume that either they agree with the racist Lieberman and his small circle of friends, or that they are too stupid to even know this is going on over there. There are other things like this, for example Turkey's refusal to admit to the genocide of the Armenian's in WWI. 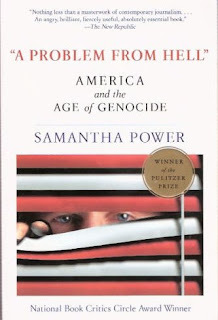 They pretend it didn't happen which is certainly ironic in that the man who coined the term "Genocide", Raphael Lemkin initially took interest in these things and became an amazing lifetime activist because of what Turkey did (read Samantha Power's excellent book "Problem From Hell: America and the Age of Genocide" for more). The Oklahoman Editorial staff from a quick search does not talk about that either. The Editors also write, ignoring things they've supported in recent years (The invasion and occupation of Iraq, the re-writing of their perfectly servicable constitution so their industries could be handed over to multi-nationals comes immediatley to mind) "...The (PRC) government says the violence was necessary to maintain social order, which paved the way for market-oriented policies that turned China into an economic dynamo." When we do it, it's no big deal. When they do, big problems. But it shouldn't surprise anyone that they are willing to discuss China's disgraceful response to their crimes while ignoring many others. Remember, this is a paper that wont publish anyone left of Sally Kern's letter to the editor all the while publishing hundreds from Ronald Bouwman. Can The Oklahoman write or run anything that is an original idea, even if it is a bunch of crap?